What is the 'necessity defense' and why do climate activists want to use it in Minnesota? Activists will argue breaking into an oil company's property was necessary to save the world. Climate protesters who broke in to an Enbridge Energy property in Minnesota in order to shut off its oil pipeline will be allowed to use the "necessity defense" in court. The Minnesota Court of Appeals upheld a decision from the Clearwater County District Court, which last fall approved the four defendants&apos; wishes to use the defense in their trial for trespassing. The defendants, one from New York and three from Washington, broke into the Enbridge property in Leonard, northwest Minnesota in order to stop oil flowing through its pipeline from Canadian tar sands fields to the U.S.
Clearwater County prosecutors had challenged the decision to allow the "necessity" defense, arguing its inclusion would confuse a jury and be less likely to result in a conviction, but the Court of Appeals ruled against them. The basic definition, as described by the legal website Nolo, is doing something illegal to prevent a more serious harm. A common example of this is breaking into someone&apos;s home in order to save that person from a fire. Establishing a defense requires proving that there was a specific threat of significant, imminent danger, there was an immediate necessity act, there was no practical alternative and that the harm caused wasn&apos;t greater than the harm prevented. – Here&apos;s how Enbridge&apos;s lobbying bill hit $5M in 2017. What will the activists argue? They will argue that they trespassed and tried to shut off the oil to prevent the greater harm from global warming. With scientific consensus being that humans&apos; continued use of fossil fuels contributes to the warming of the Earth, their act of disobedience was necessary to help prevent the catastrophic effects of climate change. As MPR reports, the defendants&apos; say the act was necessary because they have exhausted other efforts to get their elected officials to address the problem of climate change. Annette Klapstein, one of the accused, told MPR: "I hope it does mean more civil disobedience, because that&apos;s the only thing we have left as ordinary citizens when our political system will not respond to a crisis that is actually threatening the very existence of our grandchildren." The Court of Appeals decision was not unanimous, with Judge Francis Connolly dissenting. "This case is about whether respondents have committed the crimes of damage to property and trespass," he wrote. "It is not about global warming." He went on to argue "there is no direct, causal connection between respondents&apos; criminal trespass and the prevention of global warming." As the Star Tribune reports, Minnesota Judge Ann O&apos;Reilly has agreed that Enbridge has demonstrated a need to replace its aging pipeline, but thinks the replacement should be built adjacent to where its existing line is. 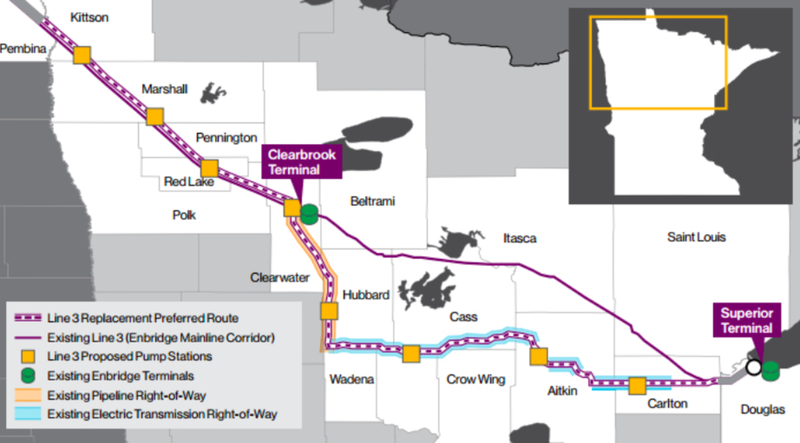 Enbridge&apos;s preferred route can be seen in the map above (the existing route is the solid purple line). As the newspaper notes, building the new line in the same location as the existing one potentially complicates matters, given the current route goes through two tribal reservations, both of which object to a new pipeline. A final decision is expected to be made by the Public Utilities Commission in June. Three are on trial for an act of civil disobedience. Tyrone Williams was shot dead in North Minneapolis on Apr. 3. CenterPoint wants to offer 'renewable' gas in MN, but what is it? The utility argues it would reduce greenhouse gas emissions. 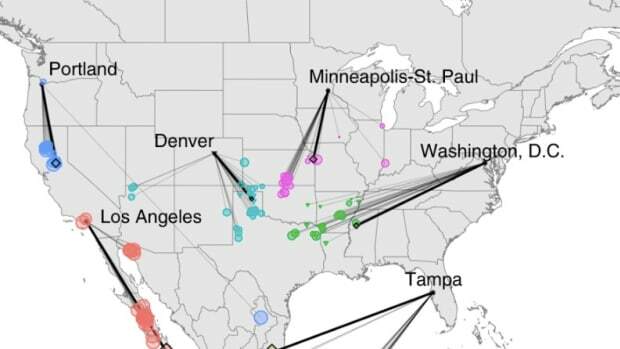 The research says that's the fate facing Minnesota unless we reduce emissions. Minnesota Democrats have some strong feelings about the decision to leave the accord. America will become just the third country not signed up to the agreement. With the federal government taking a step back in the climate fight, states and cities are coming to the fore. Minnesota is not making enough progress reducing greenhouse gas emissions, a report says.